Trends in accessories come and go, and it's always sad to see them go when you've collected quite a few! 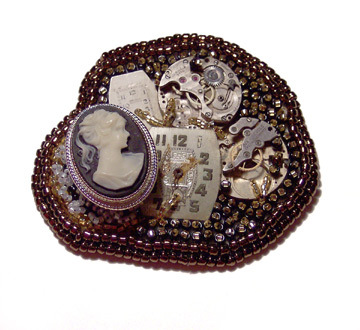 That is how this project came to be: my large collection of button-covers inspired me to create a bead-embroidered pin that would allow me to wear my button-covers as an interchangeable part of the design. 1. Choose a shank-style button that your button covers will fit on. 2. 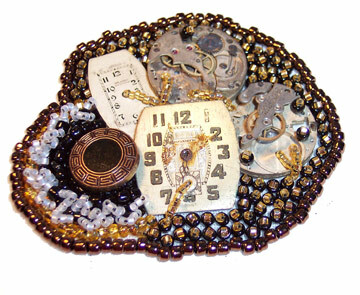 Choose beads, cabochons, and charms to coordinate with both the button and the button covers that you'll want to use. 3. Cut out a piece of foundation fabric, approx 4 x 4, and draw the shape of your completed pin's border with a permanent marker if you want to. I usually do not do this as I like to see what shape the piece will take naturally, but many people feel more secure with a plan. 4. Arrange the large focal pieces, and glue down the ones that won't be stitched into place, using E6000 . 5. Leaving an empty spot to fit the button shank, backstitch small beads (like delicas) into place all around where the button will be. 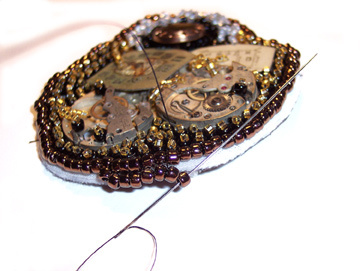 You can simply stitch the button on first, but then you will have to maneuver the needle underneath the rim of the button to fill your canvas with beads. 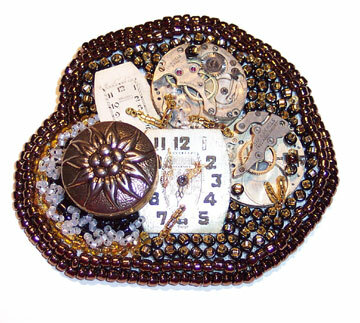 Keep these beads small so that the button will sit up high enough to accommodate the covers later. 6. Sew button in place and continue beading around cabochons until you fill just to the inside of your border, if you drew one. 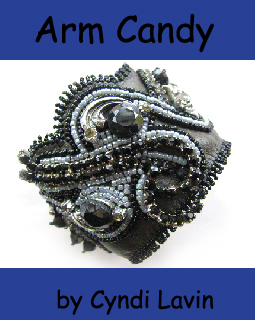 Use backstitching, small stacks of beads, and any other bead embroidery stitches you like. Use some dimensional stitches so that the button cover will be more integrated into the design. 7. Back stitch a final row of size 8/0 seed beads completely around the border. 8. Run a thin bead of fabric glue just outside the last row of beads. Let it dry. 9. Clip the buckram close to the last row of beads, being careful not to cut any threads. 10. 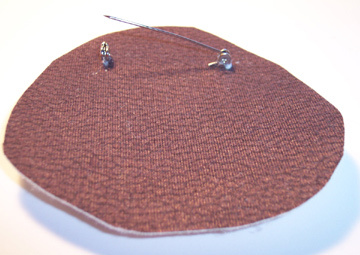 Determine the placement of your pin back and stitch it into place on the back of the buckram. 11. Cut small slits in the ultra-suede to allow the pin clasp and shank to slip through. 12. Using just enough fabric glue to create a slight tack, attach the wrong side of the beaded buckram to the wrong side of your backing fabric, slipping the pin through the slits. The glue will only be holding them together while you do the final stitching. Don't use much or you'll stain the ultra-suede where it seeps through. Let it dry. 13. Cut the ultra-suede even with the beaded buckram. Take a few small shallow stitches to anchor the thread between the two layers, close to the edge. Needle up to the top, exiting behind the border row of size 8/0 seed beads. Pass the thread between the two closest beads in the border row, pick up one #8 bead, and needle up from the bottom through all layers of fabric, exiting again just behind the border row. 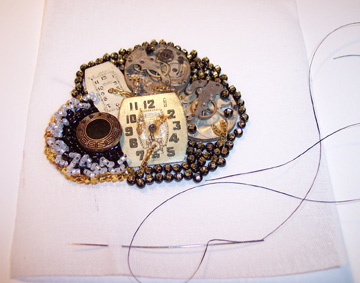 Then pass the thread between the border beads again and down through the bead that was just added. 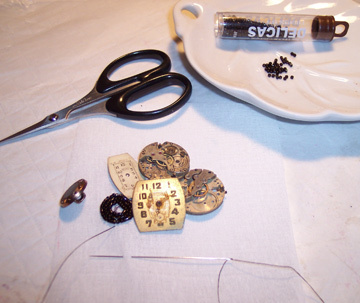 Pick up another size 8/0 bead, needle up from the bottom, and repeat the sequence for the entire shape of the pin. Other methods of finishing the edge (with edging brick stitch) as well as more bead embroidery stitches can be found in the free first chapter of Every Bead Has a Story. 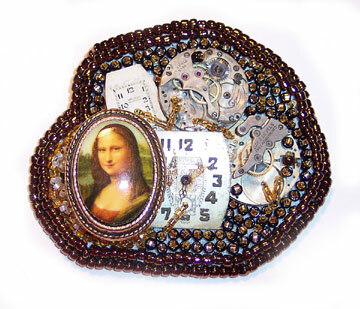 I love how you make old stuff new again, Cyndi. 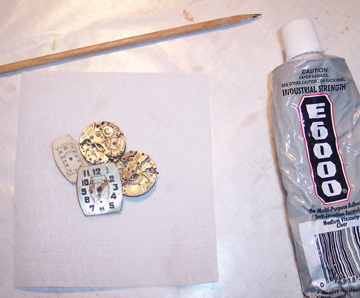 Button covers and watch parts - what smashing combo. Cyndi, this is beautiful! I love how you designed it!